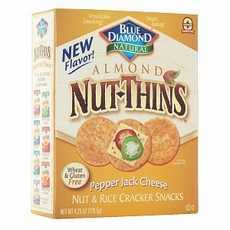 Enjoy Blue Diamond Nut Thins Pepperjack Cheese Crackers. If You Hate Guilt But Love The Flavor Of Buttery Jack Cheese With A Spicy Pepper Kick, We Have Your Perfect Snack. Our Pepper Jack Cheese Nut Thins Are Loaded With Flavor But Free Of Wheat, Gluten And Saturated Fat. Great Alone Or Paired With Dips Or Salsa. (Note: Description is informational only. Please refer to ingredients label on product prior to use and address any health questions to your Health Professional prior to use.